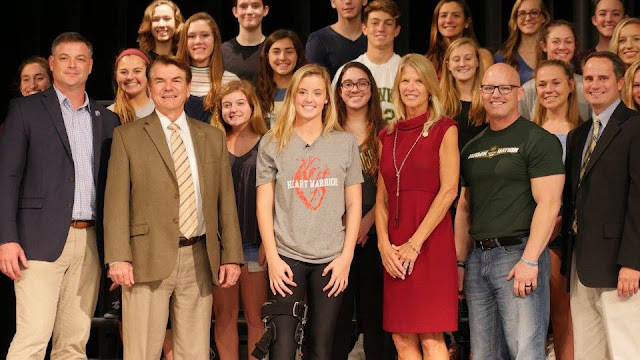 VIERA, Florida – Florida State Senator Debbie Mayfield and Representative Thad Altman introduced legislation that would require all Florida high school students to undergo CPR and AED training prior to graduation. Sen. Mayfield and Rep. Altman attended an event on Tuesday announcing the legislation at Viera High School along with Lexi Sima, a Viera High student, and her father Shawn Sima. Approximately two years ago, Lexi went into cardiac arrest at a gym and was revived by CPR and an AED. This prompted her father to become an advocate for implementing training at the high school level. Brevard County Public Schools became the 11th district in Florida requiring CPR instruction for graduation. The training will be incorporated into mandatory health classes and will use kits provided by the American Heart Association. The kits include tools which teach CPR skills, AED use and choking relief. Viera High’s student government association will be leading a grassroots effort to get a statewide resolution passed in December and will be mobilizing all the other SGA chapters throughout the state for phone-banking and meeting with their local legislators to support the bills.